Alternatively, join a full-day Guided Optional Excursion to Salzburg—the city of Mozart—or to the picturesque Bohemian town of Cesky Krumlov. Meet your ship back in Passau after your full-day selected activity for sailing. CLASSIC Join a Guided City Walk and see the Altes Rathaus (Old Town Hall) and Porta Pretoria—built in 179 AD as the entrance to Castra Regina fortress. DISCOVER Later, indulge in a Beer Tasting on board. CLASSIC Take a Guided Sightseeing Tour of Würzburg—”Pearl of the Romantic Road”— with its Old Main Bridge, towering fortress, and baroque Bishop’s Residenz—with the largest known ceiling fresco. CLASSIC Join a Guided Walking Tour of a picturesque village. Sail to Rüdesheim while having dinner on board. Enjoy free time over a glass of Kölsch pale lager—locally brewed for over 100 years! This evening, enjoy dinner on board your ship. 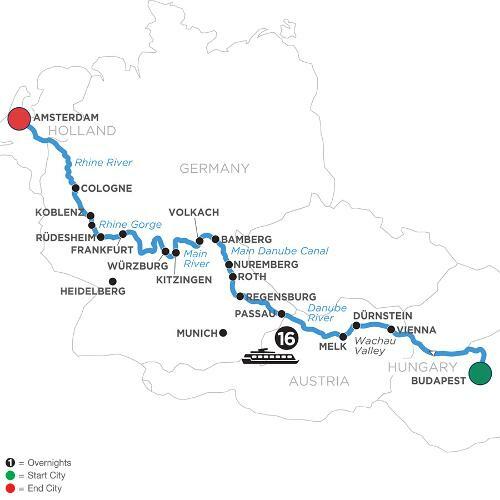 Amazing views on the Danube, Main, and Rhine rivers await on your European cruise. Embark in Budapest and sail to Vienna—the City of Music—for a guided city tour of Vienna’s gilded landmarks. See the Imperial Palace, the world-famous opera house, and stunning St. Stephen’s Cathedral. Sail to Dürnstein to walk in the steps of Richard the Lionheart or choose guided hike to his castle prison. Explore the magnificent Benedictine Abbey above Melk, and enjoy an onboard wine tasting of Wachau Valley vintages. Cruise to Passau to tour Germany’s “City of Three Rivers.” Visit the Bavarian town of Regensburg and join us for a beer tasting on board. In Roth, select a city tour, sightseeing in Nuremberg, or a tour of the notorious Nuremberg Rally Grounds. Join a guided excursion to Munich to see Nymphenburg Palace. In Bamberg, see its Romanesque cathedral amid seven hills crowned with churches. Enjoy a beer tasting on board before sailing for the quaint Bavarian town of Volkach. Visit Kitzingen in Bavaria’s largest wine-producing area. Explore Würzburg along the famed Romantic Road, followed by a visit to a Bavarian Main River Village. In Mainz, take a guided excursion to Heidelberg Castle. Visit the Rhine Valley town of Rüdesheim and hear the sounds of oom-pah-pah in a Mechanical Musical Instrument Museum! Take a hike up the vineyard hills with a cable-car ride down, or enjoy a coffee or wine tasting (based on your departure). Cruise through the stunning Rhine Gorge on your way to Koblenz, then to Cologne—with its gothic cathedral and soaring twin steeples. Take a guided city tour or a walking tour of Cologne’s historical Jewish sites.